On a tour of the Piazza Navona, where students learned about the square’s history. Now famous for it’s Bernini fountains, it was previously the site of the Stadium of Domitian where chariot races were held. Characters in the literature students read also interacted with these areas. This fall, 11 University of Washington students piloted a unique UW study abroad program during early fall start. 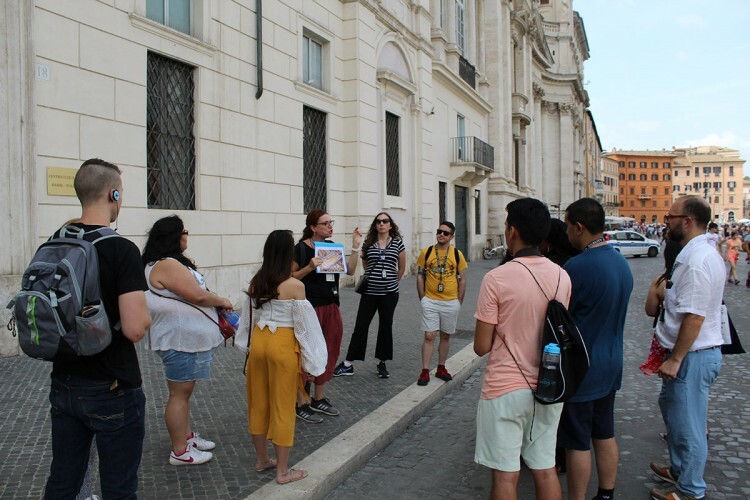 Developed by Academic Support Programs (ASP), the three-week long course, “English 295: Immigrant, Identity and Community in Post-Colonial Rome,” was held at the UW Rome Center. 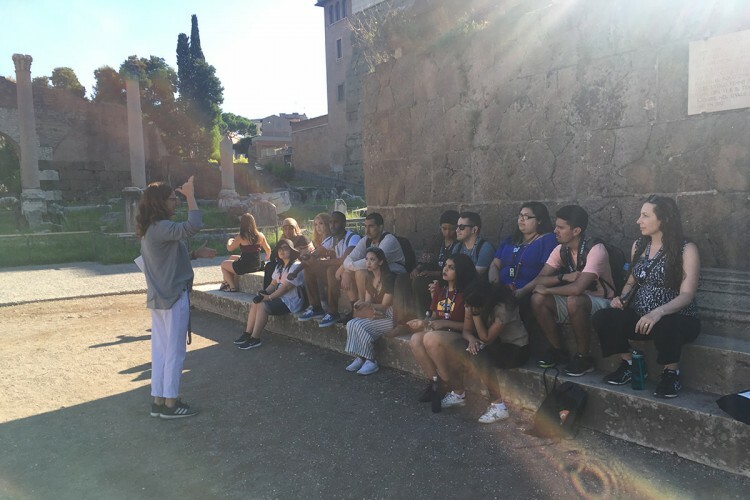 With Rome as its classroom, the course explored questions of identity and immigration in post-colonial Italy and the U.S. This curriculum was designed to help students return to the UW with an even stronger set of skills, helping them succeed at the UW and beyond. The Rome program’s focus of imagination, immigration and identity was personal for many students. Some had family roots in countries colonized by Italy; others came from immigrant families. Exploring the refugee communities helped them better understand their families’ plight. 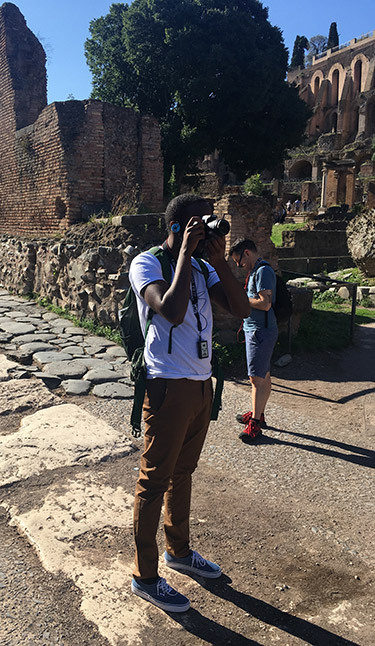 During the class, students spoke with immigrant families, read books, wrote reflections and took field trips around Italy to gain further insight into the current situation in Italy. A group of Somali students, including Mohamed Mohamed, even sought out the Somali embassy and formed personal connections with members of the community. Hearing individuals’ stories first-hand inspired students to keep an open mind and recognize the privilege and opportunities available to them, such as studying at university. Course instructor and ASP staff member Ryan Burt ‘00, ‘08, knows first-hand the transformative impact of international engagement. He studied abroad in Spain and Italy and taught college courses in Morocco. Taking pictures in the Roman Forum. Inspired by the UW Race & Equity Initiative, Academic Support Programs was dedicated to making it possible for students of all backgrounds to participate. To that end, they redesigned the application process so it didn’t include a letter of recommendation or emphasize GPAs. They received a $10,000 grant from the UW Global Innovation Fund and sought additional funding to subsidize student travel. Beyond the logistics, they focused the program on identity and immigration, something they felt their students could see themselves in. Burt and his team also infused the class with study skills students could take back to Seattle with them: time-management strategies, studying in groups, writing support, note taking strategies, critical reading skills and more. This course stems from a collaboration between Undergraduate Academic Affairs, the College of Arts and Sciences, the Office of Global Affairs and the Office of Minority Affairs and Diversity. About Academic Support Programs: Academic Support Programs (ASP) is a program of Undergraduate Academic Affairs. ASP oversees a number of programs to support student success at the University of Washington. These include teaching support classes, running an interdisciplinary study center (the Center for Learning and Undergraduate Enrichment), and working with campus partners to shape a more supportive and equitable educational infrastructure. UW Study Abroad can help you find the perfect program. Scholarships are available! Visit the UW Study Abroad website to learn more, or come to drop-in advising every Monday through Friday from 10 a.m.–4 p.m. in Schmitz 459.